After missing the playoffs for the first time since 2011, the Seattle Seahawks will take their first steps toward playing January football again when they open for training camp July 25th. Head coach Pete Carroll is entering his ninth season with the team and figures to have his hands full in a competitive NFC West. While familiar stars like Russell Wilson and Bobby Wagner are returning to lead the offense and defense, one of the biggest storylines going into camp is that the notorious Legion of Boom era in Seattle is no more. With Richard Sherman signing with the San Francisco 49ers and Kam Chancellor retiring, Seattle’s secondary has officially begun a new chapter. Chancellor’s absence at the strong safety spot will surely be felt. Even in his eighth and final season, the former All-Pro posted an overall grade of 88.5 while ranking second among all safeties in run-stop percentage. Sherman put up impressive numbers of his own in 2017, tying for sixth in coverage snaps per reception allowed (17.4) at corner while registering an overall grade of 82.7. So who will fill in their shoes? The Seahawks coaching staff saw a good sample size of Sherman and Chancellor’s replacements as they both went down with season-ending injuries in Week 10 last year. Bradley McDougald, who is slated to replace Chancellor, ended up starting seven games at safety in 2017 and showed up big in pass-defense, finishing top 20 at his position in coverage grading. Meanwhile, second-year-pro Shaquill Griffin looks to be the guy that steps in for Sherman. The Seahawks will look for Griffin to build on a productive rookie season where he finished with a lower NFL passer rating on throws into his coverage than Sherman and an overall grade of 77.2. 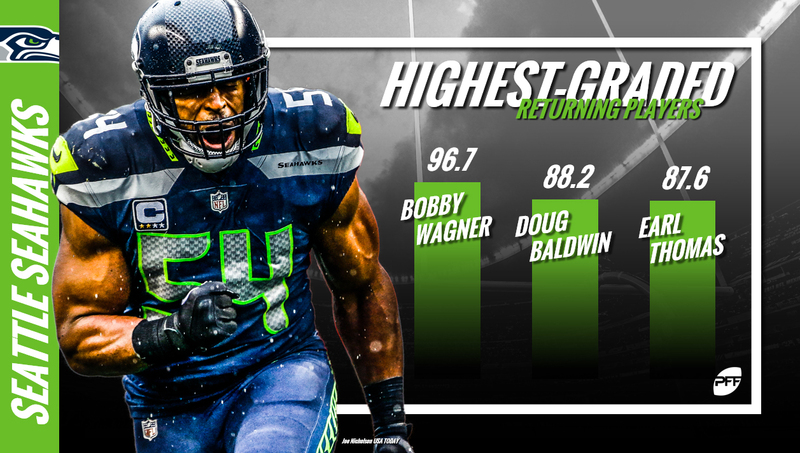 With veteran corner Byron Maxwell coming off a strong year as well (84.0 overall grade), you can see why the Seahawks may not have felt the need to make any splash moves in the secondary this past offseason. Helping round out their nickel package will be slot corner Justin Coleman. Coleman, who was acquired right before the start of the 2017 season, ended up playing 585 snaps at slot corner and racking up a respectable 82.0 coverage grade. Meanwhile on offense, the running back position in Seattle has been nothing short of a revolving door the past two seasons. With Wilson leading the team rushing in 2017, the Seahawks decided to address the need in the draft by making San Diego State product Rashaad Penny their first-round pick. Of all running backs in the 2018 NFL Draft class, Penny ranked second to only Saquon Barkley on our final draft board and it’s easy to see why. En route to finishing first in the country in rushing yards, Penny’s 128.6 elusive rating led all draft-eligible running backs in the NCAA last season. In addition to Penny, Chris Carson, C.J. Prosise, J.D. McKissic and Mike Davis are all expected to compete for snaps again this year. They’ll have steep competition in Penny though, who has already garnered praise in rookie minicamp. Making a run at an NFC West title will be the goal but if they fall short, the reason why could likely be that Seahawks didn’t do enough to replace the veterans they lost this past offseason. In addition to the secondary, replacing Michael Bennett and Sheldon Richardson on the defensive front will be a tough ask given they combined for 106 total pressures last year. On the other side of the ball, Jimmy Graham and Paul Richardson have moved on to new teams and replacing their touchdown production (combined 16 in 2017) will be crucial. Despite all of this, quarterback play in the NFL rules all and the Seahawks have one of the best in the game in Wilson. If this team hopes to have any chance of a playoff run, Wilson will need to be at the top of his game in 2018 from start to finish.